Most of the resources used by mankind are collected by mining. Since ceramics is one of the most essential and widely used materials in the modern society, there is a high demand for natural resources used for ceramic production. Most of the commonly used ceramics are manufactured from clay minerals like kaolin, while ceramics made from magnesite are commonly used for high temperature applications. Such ceramics are the primary material used for furnaces in cement production. Feldspar materials are used as a flux for the melting process of raw materials in order to optimize the production process and to minimize the energy consumption. The composition of the starting mixtures greatly influences the quality of the product. Hence, the determination of the mineral composition of the resources used in production is vital. X-ray diffraction is one commonly used technique to establish the composition of minerals in mining and processing industries. Thermo Scientific™ ARL™ EQUINOX 100 uses a custom-designed Cu (50 W) or Co (15 W) micro-focus tube with mirror optics. Since the unit consumes low power, it is completely transportable, eliminating the need for an external water chiller. The same unit can be transported between laboratories without requiring special infrastructure. Compared to other diffractometers, the ARL EQUINOX 100 provides rapid data collection times due to its unique curved position sensitive detector (CPS) that measures all diffraction peaks simultaneously and in real time. Therefore, it is suitable for both reflection and transmission measurements (Figure 1). Measurements on ball clay, kaolin, magnetite and feldspar samples (3 minutes, 20 Hz) were carried out in reflection mode. 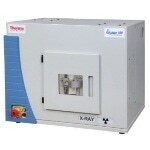 Cu Kα (1.541874 Å) radiation was used to analyze the sample for 10 minutes by rotating the sample during the analysis. Qualitative phase analysis was performed using the combination of MATCH! software and ICDD pdf4+ database, while Rietveld quantification was performed using MAUD. Figure 1. ARL EQUINOX 100 X-ray diffraction system. Successive Rietveld refinements were performed to determine the phase composition of the samples. A sample of ball clay is composed of 15% and 85% of quartz and kaolinite respectively, which is quite untypical for ball clay (Figure 2). A mineral with similar composition is kaolin which, in this case, comprises of 7% quartz and 93% kaolinite (Figure 3). Figure 2. Rietveld fit of a ball clay sample (5°-100° 2θ). Figure 3. Rietveld fit of a kaolin sample (5°-100° 2θ). In this case, Magnesite (98%) is only accompanied by traces of dolomite (1%) and lizardite (1%), which highlights the quality of this material (Figure 4). Figure 4. Rietveld fit of a magnesite sample (5°-110° 2θ). Various types of feldspar materials are known. Here, the sample largely comprises of microcline (98%) with trace amounts of quartz (2%) (Figure 5). Figure 5. Rietveld fit of a feldspar sample (5°-100° 2θ). The ARL EQUINOX 100 is suitable to determine the phase composition in mineral samples associated with the production of ceramic materials. MATCH! and MAUD meet all requirements for the determination of the phase content as well as the quantification of these phases. To summarize, the ARL EQUINOX 100 is a convenient and cost-effective XRD solution for use in QA/QC procedures in the ceramic industry, and due to its user-friendliness and robustness, it is also appropriate for use at mining sites. What will be cost implication of kaolin sample I want to charactirize using XRD technique, from Nigeria.